Bratislava is situated on the River Danube and is the capital city of Slovakia. This independent republic was formed in 1993 when it detached itself from Czechoslovakia. The country became Slovakia and the other part became the Czech Republic. 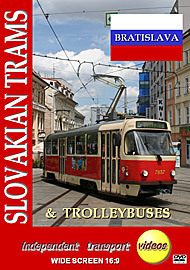 The tramway in Bratislava (Električky) opened with electricity in 1895 and has operated ever since. There is also an extensive trolleybus and bus fleet running in the city and its environs and is currently operated by Dopravný podnik Bratislava (DPB). This historic city, in the area near the Danube is very picturesque with beautiful classical buildings all around, however, the out of town suburbs are dominated by the former Eastern Bloc large grey apartments associated with the Communist era. There are a number of liveries used by DPB, a new all over red with large colour blocks is being introduced on repaints to the trams, buses and trolleybuses. Most of the trams are still in the ubiquitous red and cream livery that was to be found in most cities in Eastern Europe, although there are some sporting a red, blue and silver scheme as well as the new overall red livery. Some trolleybuses are running in their old red, white and grey scheme and a number have been painted in overall red. Buses tend to be in a similar scheme, but there are many new buses now in service in overall red. Some of the trams carry overall adverts to add yet more interest and colour to the scene! Our filming starts at the central railway station with a good deal of trolleybus action. At the time of filming the tram lines to the station were closed, as well as the tunnel that runs under Bratislava Castle, the latter was due to ingress of water. From the railway station we move along Šancova a very busy trolleybus route towards Obchodná, the main shopping street which features the trams. The Tatra T3 and T6 make up the bulk of the tram fleet as well as a number of rebuilt Tatras, however, look out for a new Bombardier Flexity Outlook demonstrator in service as we film at the junction of Obchodná and Námestie Slovenského Nârodnêho Povstania. We then board Tatra T3, 7843 + 7844 to our next location at Mostova. We then move to the pretty Vajanského Nábrežie and Jesenského area. With further filming done at Stúrova we board Tatra T3, 7835 + 7836 back to Obchodná to complete our tram filming for the day. We then travel on Skoda trolleybus 6264 for a spirited run to Pražská where we see a number of trolleybuses in action from an overhead walkway. Our final scenes are recorded at Šancova during the busy rush hour where the buses old and new mingle with the trolleybuses.